Hardcover, 9.5 x 12 in. / 352 pgs / 450 color. Edited with text by Christophe Cherix, Manuel J. Borja-Villel. Text by Benjamin H.D. Buchloh, Cathleen Chaffee, Jean-François Chevrier, Kim Conaty, Thierry de Duve, Rafael García Horrillo, Doris Krystof, Christian Rattemeyer, Sam Sackeroff, Teresa Velázquez, Francesca Wilmott. Marcel Broodthaers’ extraordinary artistic output placed him at the center of international activity during the transformative decades of the 1960s and 1970s. Throughout his career, from early objects variously made of mussel shells, eggshells and books of his own poetry, to his most ambitious project, the Musée d’Art Moderne, Département des Aigles (Museum of Modern Art, Department of Eagles), and the Décors made at the end of his life, Broodthaers occupied a unique position, often operating as both innovator and commentator. Setting a precedent for what we call installation art today, his work has had a profound influence on a broad range of contemporary artists, and he remains vitally relevant to cultural discourse at large. Published to accompany Broodthaers’ first retrospective in New York, this volume examines the artist’s work across all mediums. Essays by the exhibition organizers Christophe Cherix and Manuel Borja-Villel, along with a host of major scholars, including Benjamin H.D. Buchloh, Jean François Chevrier, Thierry de Duve and Doris Krystof, provide historical and theoretical context for the artist’s work. 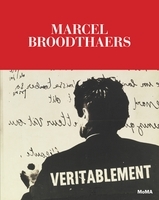 The book also features new translations of many of Broodthaers’ texts. 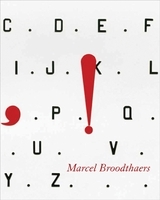 Marcel Broodthaers (1924–76) worked as a poet and critic until the age of 40, when he declared himself a visual artist. Over the next 12 years, he moved between Brussels, his birth city, and Düsseldorf and London. 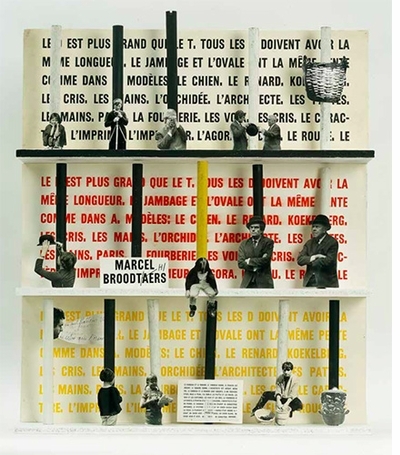 From 1968 to 1972 Broodthaers operated the Musée d’Art Moderne, Département des Aigles, an itinerant museum devoted to the exploration of the role of the institution itself and the function of art in society. Featured image is reproduced from Marcel Broodthaers. Broodthaers at his closest to poetry looks both ways, caught between love of the past and fear of the present. gives the breadth of his art room to breathe. clarifying… [it is] ambivalence, rather than militancy, that sets Broodthaers apart. [An] all-around provocateur who parodied the institutional qualities of a museum by creating one of his own... Acute awareness of the creative process... informs Broodthaers's entire oeuvre. Evident throughout… is the artist’s insistent message that formal decorum conceals and often intentionally occludes the power of real truths, and that the poet/artist has the key to unlock those verities by playfully rearranging the representational signifiers of cultural capital. MOMA’s near-definitive account of the work of Broodthaers was a standout among standouts, providing a rare opportunity to consider firsthand the labyrinthine imagination of the twentieth century’s most elusive and enigmatic artist-poet. 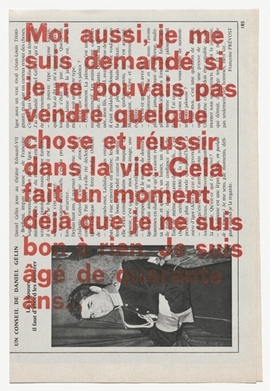 Broodthaers created his own context for experiencing his work. This expansive and generously illustrated catalog, which accompanied a recent retrospective, is useful for gaining a better understanding of this mysterious and multifarious artist, whose productions and preoccupations have become increasingly central to the history of modern art. 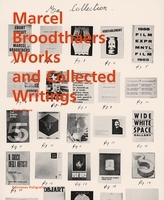 Edited by Marie-Puck Broodthaers. Text by Wilfried Dickhoff, Bernard Marcadé. Foreword by Gregor Jansen, Vanessa Joan Müller. Text by Elodie Evers, Gregor Jansen. FORMAT: Hbk, 9.5 x 12 in. / 352 pgs / 450 color.